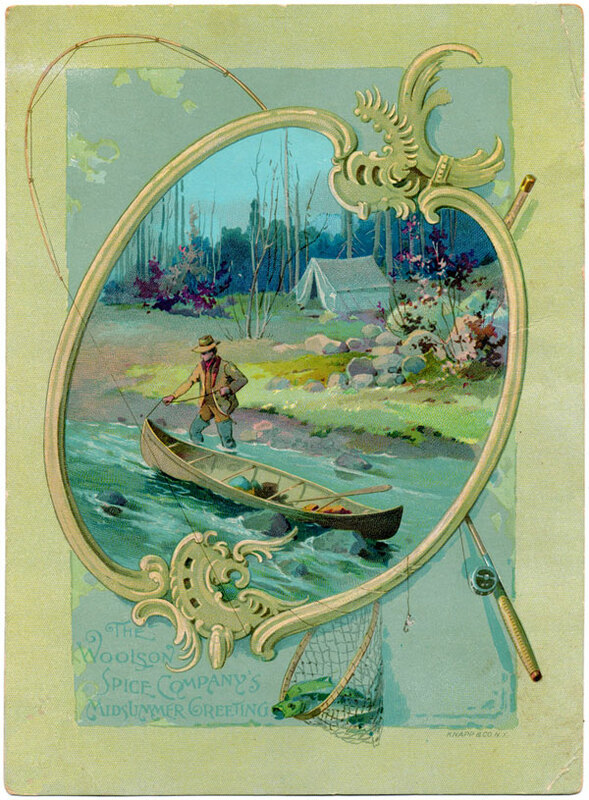 I found the most gorgeous antique trade card with an illustration of a fisherman camped along the river bank. Then I remembered that I also had an image of a fishing creel in one of my old printer’s stock art catalogues. I knew these would be just perfect for creating a Father’s Day Message Box. 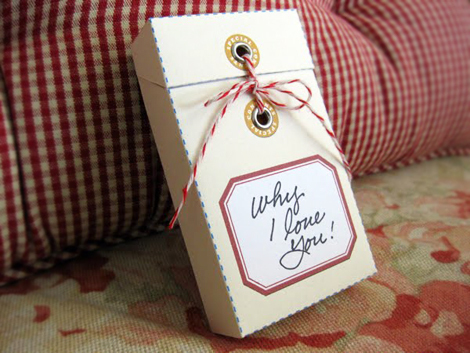 A message box can be filled with all kinds of loving notes, photos, trinkets and mementos to share with someone special. These boxes hold anything the size of a standard business card or smaller. A few years ago, I designed a few message boxes for Mother’s Day. 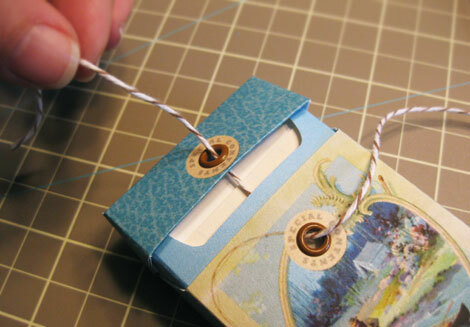 You will need to follow that tutorial for putting together this one for Father’s Day. The instructions are HERE. For this box, download the PDF file by clicking on the template image below. 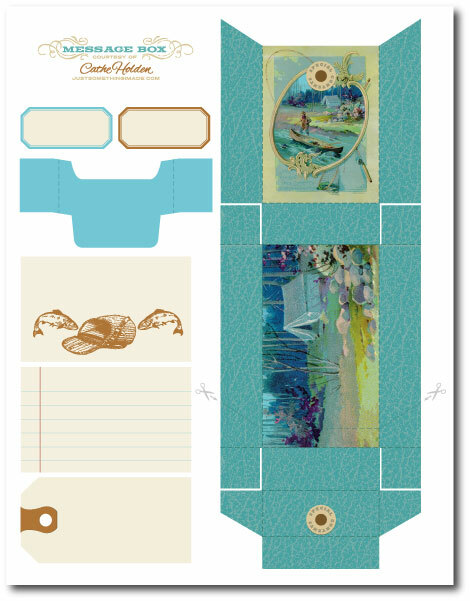 Print the template onto cardstock using your printer’s finest settings. 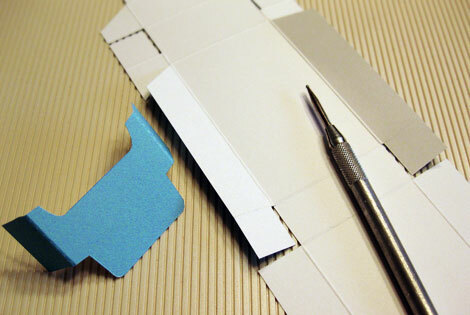 Carefully cut out the template pieces. Score or cut along designated lines and fold along the scores. 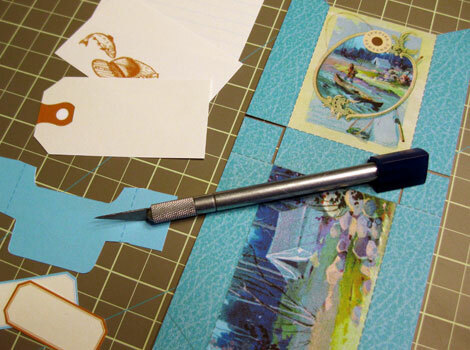 If you do a lot of paper crafting, I highly recommend the Martha Stewart Scoring Board. Assemble the pieces as shown in the instruction link above. 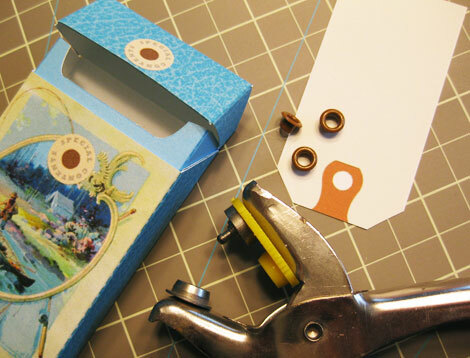 Use grommets to reinforce holes in box and gift tag. 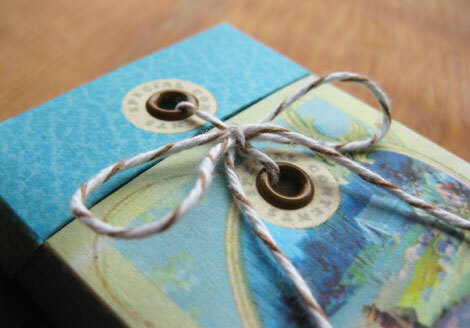 Use the little labels to customize the box. 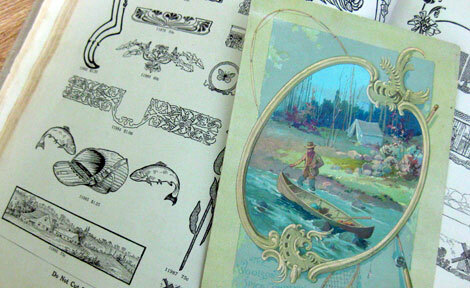 Here is the cleaned-up image of the antique trade card (click to enlarge), and the vintage creel and fish clip art. You can design your own message box using the blank template from the Mother’s Day Message Box post. If you make a message box, I would love to see it. This entry was posted in Father's Day, Free Clip Art, Free digital downloads, Free Jpgs, Free PDF files, free vintage art, general craft, Holiday Crafts, Printables, Vintage blank labels, Vintage Ephemera and tagged Father's Day. Bookmark the permalink. Wow, this is perfect for my husband. I’ve been looking for something different to give him and I think this is it. Thanks for showing the process. Once again, very imaginative and beautiful, Cathe! You are such an inspiration. how adorable this is! thanks for the idea! thank you so much for sharing. My husband is an avid fisherman and this is perfect. Your work is quite beautiful and truly creative. I am so glad that I happened upon a link to your blog on 2Peas forum today. I immediately bookmarked your blog. Again, thank you. i never know what you will come up with next. it is always something clever and pleasing to the eye. i can see making a bunch of these for each member of our family to share with my husband for the upcoming special day. as always i love this…xow. gorgeous gorgeous wonderful…thank you much! I am going to check out the Mothers day one you did. I love this idea and your design is exquisite, truly beautiful. Thank you so much for providing a gift that is thoughtful and one that will be cherished forever. You are such an artist and creative. I want to say this everytime when I’m here. Finally, I did it. And thank you very much for sharing all this for free. Wonderful!!! Do you have a recommendation for a good grommet tool? This would be a killer Father’s Day gift… I’m gonna send it to my wife, she would love to put one together for her dad! You are just so wonderful! Everything you make is a delight & you’re so generous. Thanks! Thank you, Cathe. You certainly are great to share your wonderful ideas and talent. Really love it. Made some with my own craft paper with the prior template, and recieved many ooohs and aaahs. My hubby does not fish, but my sister does, she would like this!! Great idea! I wish my dad was still here on earth so that I could give him one, but it is a good way to give anyone love and gratitude! What a wonderful idea, a beautiful design. Thank you so much! Cathe I enjoyed seeing your pretty things. Hope I can find the magazine with your napkins – so cute. How talented you are. PS Cathe love the message box. I want one – what do you charge?? Since it is no longer Father’s day. I’m making a message box for my boyfriend. I’ll be making a note for him for straight 30 days and I’ll enclose it in this card. See if he won’t fell to his knees and beg me to marry him. Just kiddin’! thanks for the idea! I loved it! Thanks for sharing!!! Wonderful Website!! Thanks so very much for sharing and teaching. Could you add the Pinterest Logo to your site please. hi! can i get a copy of the template you used? I love this idea! 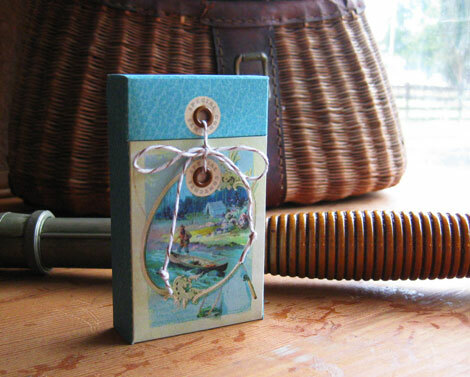 The images are great too, Just the fisherman’s photo would make a great DIY card illustration! Thanks Cathe! Great image and really nice project. I like the colors in this one. 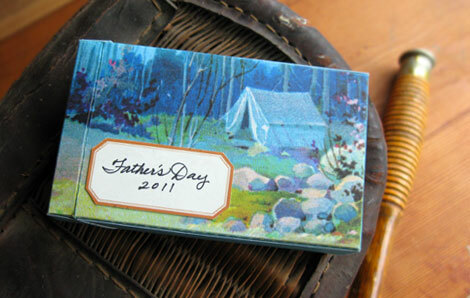 So many Father’s Day images, cards and so forth are in browns and greens. Thank you so much for a imaginative project. Thank you so much for an imaginative project.